No matter the job, most come with certain perks. If you work for a card company, it sometimes means free cards. 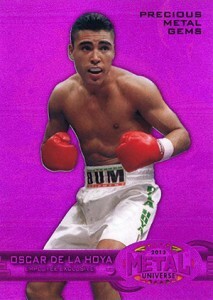 Upper Deck has a lengthy history of producing exclusive cards for their staff. The latest is a set of Purple Precious Metal Gems. Six cards were produced, each numbered to 125. 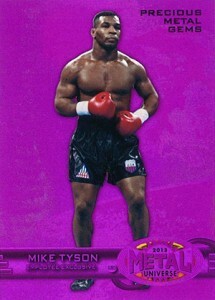 Featured on the cards are champion athletes outside of the "big four." 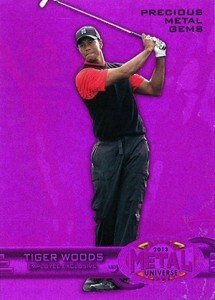 The biggest of the Purple PMGs is Tiger Woods. 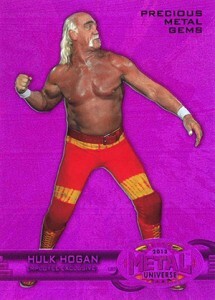 He is joined by rival golfer Rory McIlroy, Mike Tyson, Hulk Hogan, Michael Phelps and Oscar de la Hoya. 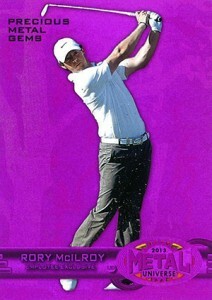 The cards carry the distinctive classic PMG look, although the purple hasn't been used before. It's extremely bright, just the way PMG fans would have it. Card backs carry a note of gratitude attributed to the late Richard McWilliam. Previous Upper Deck cards have included memorabilia and autographs from company spokesmen, past and present, like Michael Jordan, LeBron James, Derek Jeter, Mark McGwire and Kobe Bryant. Because of their rarity, many of these cards are in high demand. Click on the player's name or card image to shop for singles on eBay. Upper Deck Ben Simmons Employee Exclusive Card - Mint Condition!